The Endangered Species Act is struggling to protect America’s wildlife. Hundreds of species are currently in the pipeline for listing decisions by the U.S. Fish and Wildlife Service, and as industries expand and climate catastrophe looms, that number will likely grow—culminating in an extinction crisis. Among the animals at risk is the greater sage-grouse, an iconic rangeland bird that has declined in number over the past century as booming oil, gas, and other development has encroached on its sagebrush habitat. The U.S. Fish and Wildlife Service (USFWS) can implement programs to help save this bird—that's where you come in. Take action today: Tell the USFWS to put smart conservation into action. Thank you for all you have done to protect species on the brink. I'm writing today to ask you to continue that great work by supporting conservation programs that meet high standards and have the capacity to put species like the greater sage-grouse on a positive trajectory. In keeping with the robust Range-Wide Mitigation Framework that you put forth for the greater sage-grouse, I ask that you continue to hold impact industries to the highest standards of mitigation and to support innovative solutions that enroll our nation's vast working landscapes in the sage-grouse solution. 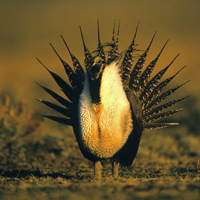 Combined, the work of your agency, the Bureau of Land Management and the U.S. Department of Agriculture has demonstrated high commitment to and investment in the greater sage-grouse. Thank you for your steadfast support in sustainable conservation solutions.